Students or, to be precise, teenagers are the group of individuals who are extremely vulnerable to waste of time or mismanagement. The reason being they don’t realize the importance and value of time. Their minds are too unstable to focus. It is only when factors such as assignment or journal submissions and exams creep in that they start wishing they had some more time in hand. 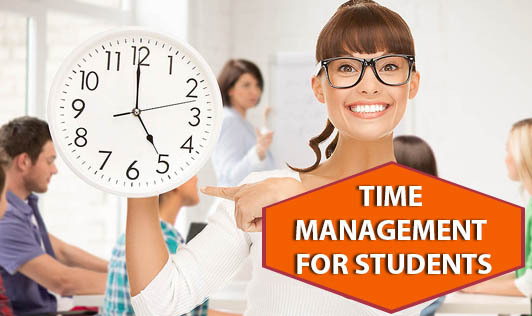 Effective time management can greatly influence the success of students in school and college life. Time management, for students, does not mean restriction of recreational or extra-curricular activities. It does not mean completely dedicating the entire day to studies. With proper management you’ll still get sufficient time to hang out with friends, watch movies and play games. Just that, unlike the norm of continuing a leisure activity for several hours together, time management will help you to space out your activities throughout the day and limit the time spent doing them. Prioritizing tasks: The main problem with students is the inability to prioritize daily tasks. An easier way to do this is listing down everything that you want to do in a day. Then analyze the urgency to complete each task. This will help you to prioritize you daily tasks and build up a strong plan for the day. Flexibility: There will be times when your plan will have to be restructured or modified due to other tasks or unavoidable circumstances. Being flexible in such situations will help you to make the most out of the remaining time. Commitment: There are several individuals who never fail to plan their day and prioritize their tasks. Despite of that they can never achieve their short-term goals. The reason is lack of commitment. What is the use of making a plan, if you can’t follow it? If you really want to enjoy the benefits of time management, you should be honest and committed to your schedule.